The Novena to the Mother of God for the Nation begins Saturday, September 29th. Catholics have always turned instinctively for help to the Mother of God in times of need. And so, in 2012 we turn to Our Lady for help. Many of the values that shaped our Country from the beginning seem to be at risk. Pope Benedict XVI and the American Bishops have noted the erosion of religious freedom in the United States, the first value guaranteed by the Constitution. This Novena to the Mother of God for the Nation will remind us of some of the central truths of the faith, in particular, the Incarnation, passion, death, resurrection of the Lord and Mary's unique role in our salvation. It will be, in a way, a catechism lesson that challenges us to a deeper conversion to Christ and a more generous life of charity. 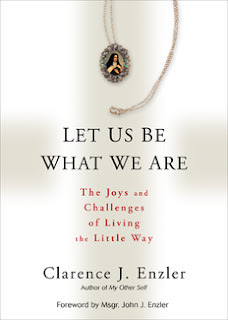 “Let Us Be What We Are: The Joys and Challenges of Living the Little Way” by Rev. Dr. Clarence J. Enzler was originally published in 1978 and has been recently reissued by the Christian Classics division of Ave Maria Press. Enzler (1910 – 1976) held a doctorate from the Catholic University of America, worked for the U.S. Department of Agriculture, served as a feature editor with the precursor to the Catholic News Service. He also was ordained a deacon in the Archdiocese of Washington, loved his wife and thirteen children, and wrote several books. Enzler was truly a man who lived life to the fullest. Enzler had a great devotion to St. Therese and wanted to emulate her Little Way to God. This particular book features two parts. The first part tells of Enzler’s efforts to unite his suffering through prostate surgery with the sufferings of Jesus. He discusses his life-long struggles with spiritual pride – how he would rather not share the secrets of his spiritual life but that he has felt called to do so – how there is always the danger of thinking only of oneself and enjoying the attention being given to you. 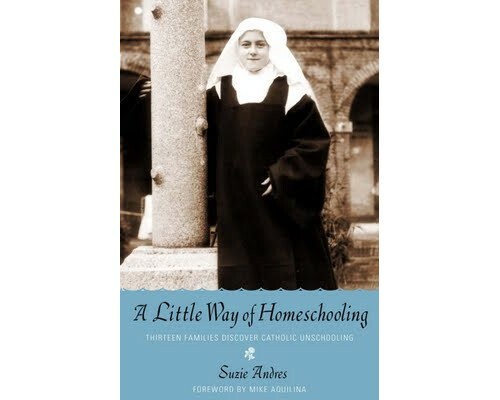 He writes, “Help me to imitate Therese and like her to glory in being inconspicuous, small, and overlooked. . . . Help me to take no pride in any homily I may preach, any words I may write, any achievement I may accomplish. Let me realize, Lord, that all success comes from You and give all glory to You.” In this section, he also begins to share how he developed his relationship with Jesus from the time he was young. Sadly, this portion of the manuscript is left unfinished due to his death. The second part is complete and the stronger section of the book. It is the portion which gives the book its title. “Let us be completely what we are” is a quote from St. Francis de Sales. By the same token, Enzler emphasizes the uniqueness of each one of us. In keeping with the teaching of St. Therese, he shares how each of us is called to be a saint, but in our own way. He offers the example of St. Francis Xavier and St. Therese. These two saints lived radically different lives, but both are considered patrons of the missions and are models of holiness. “All that God asks is that we take the coin of His gifts and turn them into a token of love to give back to Him. . .We must understand that each of us in the Mystical Body has a place of his own and for each of us, God has a plan of His own. . . We must strive to be the saint God wants us to be, not the saint we want to be.” We each must want to be a saint and then do our best to love God and love our neighbor. We must heed God’s wishes for us as we live out our daily lives. He also offers one of the best explanations I have ever seen on the balance between human free will and God’s omniscience. “Let Us Be What We Are” is a good reminder to make the most of our lives by living them in harmony with God. Only in following Him can we live fully and be the people God created us to be. Sue Elvis is having a drawing for 3 kindle-copies of A Little Way of Homeschooling, the book I recently named "The Best Book on Homeschooling I've Ever Read"
Sue is doing the drawing in honor of St. Therese, whose feast day is coming up on October 1st, and whose message of God's infinitely tender and compassionate love for us is such a big part of this little book. Ave Maria Press is presenting a free webinar October 9th from 3 - 4 pm EST on Supporting Motherhood in Parishes. In a parish environment, there is an increasing need for volunteers in various ministries and yet there is also an audience that needs ministry attention: mothers. It's a group that serves others in many invisible ways and yet is often ignored and overtapped. Sarah Reinhard, author of A Catholic Mother's Companion to Pregnancy: Walking with Mary from Conception to Baptism (Catholicmom.Com Books) , will consider how we minister to mothers within our parish communities. How can we support the mothers in our parishes throughout their mothering journey? What tools can we use to minister, encourage, and relate with them and foster the growth of our parish communities? How do we tap into the social nature women naturally have with the overbooked and overworked nature of the life many of them actually have? This webinar will reflect on ways to approach the mothers of our parishes, and especially those who have to juggle children's schedules, working responsibilities, and the need for more spiritual support from their parish family. November is the month set aside in the Church for a special remembrance of those who have gone before us in death. But any time is a good time to pray for the souls in purgatory. This prayer came in the mail this week. It is from the Association of Marian Helpers. Visit them at www.marian.org or at prayforsouls.org. Merciful Father, hear our prayer and console us. As we renew our faith in Your Son, whom You raised from the dead, strengthen our hope that all our departed brothers and sisters will share in His resurrection, who lives and reigns with You and the Holy Spirit, one God, for ever and ever. Eternal rest grant unto them, O lord, and let perpetual light shine upon them. · Insufficient safeguards against abuse: there are no oversight, investigative, data verification, or enforcement procedures to prevent abuse; and an heir may be a witness to the patient’s signed request. · Predictions of end of life time frames are highly inaccurate; sometimes predictions are under estimated by six months to more than several years. · Assisted suicide is unnecessary for improved end of life care. Improvements for the quality of life at the end of life already exist. · Doctors should not participate in assisted suicide. The Massachusetts Medical Society represents more than 24,000 physicians and medical students in the Commonweatlh of Massachusetts. To find out more about Question 2 and their opposition to Prescribing Medication to End of Life visit www.massmed.org/question2. And please share this with family, friends, and members of your church. It’s important that the public know a variety of groups are standing up in opposition to Physician Assisted Suicide, and this very flawed and dangerous ballot initiative. Thank you. In the Gospel (Mk 9:30-37), Jesus teaches "Whoever receives one child such as this in my name, receives me; and whoever receives me, receives not me but the One who sent me." Each child is a gift from God, regardless of the circumstances of his or her conception. Each child has a God-given right to live. When Cardinal Joseph Ratzinger was elected as Pope Benedict XVI, my heart sank. Anyone but him, I thought! Over the years, however, as I have read and enjoyed many of his books and learned more about him as a person, I have truly come to respect, admire and appreciate him. I actually think that he and I have somewhat similar personalities! One of my (many!) dreams is to work in a library so I read with great interest this article in the National Catholic Register: Benedict's Dream Job: Vatican Librarian. It turns out our esteemed pope once dreamed of being a librarian and archivist at the Vatican library. As the article states, "The disclosure is understandable, given the Holy Father's love of book, how he treasures his own personal library and his skill in teaching the faith." As for me, God seems to fulfill my dreams in his own time and in ways somewhat different than I might expect, but I've recently been put in charge of my parish library, so on a small scale I am becoming a librarian after all! Now, if God will only provide me the time to actually work on this task, I will be all set . . . The balance between God's omniscience and our free will is a problem that has weighed on my mind since I was eight years old. While I have reluctantly come to terms with the fact that I will never understand this conundrum this side of heaven, I still find other people's efforts to explain it interesting and I always read them with interest. God sees all that He will ever create and sees each particle of it in its fullness, in all its phases and facets. he sees the effect on everything that exists of the [natural] laws He has created . . . He sees the results of man's free will, how every person will use his or her free will in every free action of his or her life. He balances all these actions and reactions, all the events of history, those governed by natural law and those open to human freedom . . . He balances all that might be if He did this or if He did that - and then in His wisdom He decides that this is what man's freedom should be, this is the potential of his intellect, these are to be the qualities of matter, the capabilities of animals, of fish, of birds, of insects, not only of animals as a species but of each individual animal according to the complex interplay of situations and events that He foresees will take place. This is the meaning of the old saying that "this is the best of all possible worlds." It is the world that God has foreseen, permitted, and provided for. If man perfectly followed God's will, the world would be quite a different place. But God will not force man to follow His will. He will not coerce man to goodness. . . But God sees the effect of every sin just as He sees the effect of every act of virtue. And He provides for it. He permits sin, but He does not permit sin to wipe out His plan. Sin will never conquer. He is in charge. . .
God has foreseen it, . . . He permits it, and . . . He has provided for it so that it will contribute ultimately to the victory of goodness over evil, of God over Satan. The end of it all will be great and good, perhaps not in our time or that of our children - but eventually, sometime, because God has provided and God will not be mocked, and God is in charge. To some extent, I think we are all "fixers." When someone is sick or hurting, we want to do something to help the situation. Sometimes, however, the best thing to do is simply be with the person, to share our time and our presence. But, despite our good intentions, that can be so hard. What do you say when someone is hurting or ill and there is no indication that the situation will get better? Our fear of saying or doing the right thing can keep us from saying or doing anything at all. Sister Karen Zielinski, OSF, offers some practical ideas of what to do and say in this situation in her recent article for St. Anthony Messenger: You Visited Me. Francis of Assisi inspires me. Thomas of Celano wrote, “Francis once took a certain sick brother, who he knew had a longing for grapes, into the vineyard and, sitting down under the vine, he first ate to give the other courage to eat.” Francis sat down with the brother and ate. He did not just send the brother the grapes. He was present. Let us all share grapes with our sick loved ones. It's been a while since I added a new block to my Patron Saint Quilt project. I really only get to work on these on Saturday nights (my one night off from work) and in recent weeks I needed to get caught up on scrapbooking. In any event, my latest addition is a block in honor of St. Clare, the close friend and follower of St. Francis who started the Poor Clares. I'm a very introverted person and have never had many friends, but the ones I have had (and continue to have) have been very precious to me and I am so thankful for them. She has compiled a good list. Thankfully for people like me, one person can fill more than one of these roles! But, we all need friends - special people to be there in good times and bad, to laugh and cry with us, to celebrate our successes and tell us when we are wrong, people to pray with and for us, and people who hold us in their hearts even when we haven't spoken in ages. True friends are such a rare gift. Whether a friend comes into our lives for a season or a lifetime, the bond of friendship is a special one and something to be treasured. Imagine Sisters, a new online organization founded to be the nexus for media and information about discerning a vocation as a Catholic Religious Sister, will launch its first viral vocation initiative, The One Rose Project, on October 1, 2012. The campaign promotes a personal encounter on October 1, 2012--the feast of St. Therese of Liseux. Participants will invite the young woman they know to consider a call to consecrated Religious Life by giving her a single rose in the spiritual legacy of St. Therese. I was clearing out a drawer the other day and came across this prayer for seminarians. It was put out by the vocation office of the Diocese of Springfield, MA. You can visit their website and find out more about vocations to the religious life at www.myvocation.org. Lord Jesus, our Loving Savior, look kindly upon those who have embarked on the road towards the priesthood. Show them your love, and guide them on a path of wisdom and learning which will enable them to fulfill your call to shepherd your people as priests. Help them through the difficult and challenging times when they face important decisions of choice. Do not abandon them, but may your Holy Spirit always be near to give inspiration and strength. We ask, Lord, that you keep them safe from all dangers of body and soul. May they grow in a spirit of holiness and justice each day, and may zeal for souls lead them to perseverance in their calling. Amen. In The Lego Experiment Part 1, we melted a Lego brick to see whether it would melt, and if so, at what temperature. Today, we continued our torture of plastic bricks (I keep telling my children that the bricks gave their lives for science) by comparing how a Lego brick and a MegaBlock brick melted. Our hypothesis was that the less-expensive MegaBlock (the black block in the photos below) would melt more. We were wrong. The Lego brick actually melted more quickly. View the evidence below. As part of our religion experience this year (I hate to call it a class - after all our faith should permeate all that we do), the boys and I are using Following Christ , the 6th book in the Faith and Life Series. Chapter 3 was on prayer. Now, whole treatises have been written on prayer. I've read quite a few of them. This was just a chapter, but it was a good one and very age-appropriate for my pre-teen children. Form the habit of speaking to God as if you were alone with him, familiarly and with confidence and love, as to the dearest and most loving of friends. Speak to him often of your business, your plans, your troubles, your fears - of everything that concerns you. Talk with him confidently and frankly; for God does not often speak to a soul that does not speak to him. Teaching Through Frying Pan Math offers a unique idea for helping kids who struggle with memorization learn math. The title on the blog references ADD, but I know that many children with Aspergers struggle with memorization as well. Yes, the same child who has encyclopedia-level knowledge about his or her areas of interest can somehow greet a math problem or spelling word as if he or she is encountering it for the first time every time! This could also be a great game for young children who are learning math problems for the first time. 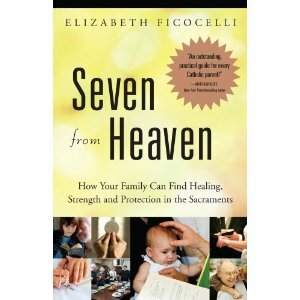 While Seven from Heaven will help adults understand the sacraments more fully, Ficocelli’s intention is truly to help parents then educate their children about this aspect of our faith. By making the sacraments integral to one’s family life, the family will then be transformed. As one might expect, Ficocelli focuses on each of the seven sacraments: Baptism, Reconciliation, Eucharist, Confirmation, Matrimony, Holy Orders, and The Anointing of the Sick. She discusses the blessing of each sacrament and its important role in our lives. What makes Seven from Heaven truly valuable and unique are the ways Ficocelli suggests to make these sacraments come alive for children. Children, as much as adults, are prone to asking “What is in it for me?” When it comes to the sacraments, the answer is “everything!” It is a Catholic parent’s job to help their children understand the beauty and blessings of these gifts from God. With her practical suggestions, Ficocelli helps make that job much easier. For example, when preparing a child for going to confession, she suggests having that child write a letter to Jesus about what he or she would like to talk to the priest about. The year a child will make First Communion is a wonderful time to have the whole family pray in a special way for that child. Praying to the Holy Spirit for the grace of His gifts is a means of making confirmation more tangible. A child can pray for his or her future spouse from a young age. A family can spiritually “adopt” a seminarian to pray for and write letters to in order to connect the family with the sacrament of Holy Orders. Helping to care for the sick and dying can underscore the importance of the sacrament of the Anointing of the Sick. The sacraments are such wonderful gifts! Seven from Heaven will help foster or renew your enthusiasm for them. As Ficocelli states in the last chapter, “When we revitalize the family through God’s graces, we revitalize the Church and, in turn, the world!” Why would we ever want to miss that opportunity? October Baby is Now a Novel! Are Some "Less Worthy" Than Others?